William Keene is cast as the Rev. Hobart M. Tucker, a New York minister visiting Mayberry. Invited to deliver the Sunday sermon, Tucker advises the local citizens to "slow down" and start enjoying life. Taking heart, the locals prepare for a relaxing band concert-and in the process, end up working twice as hard as before! 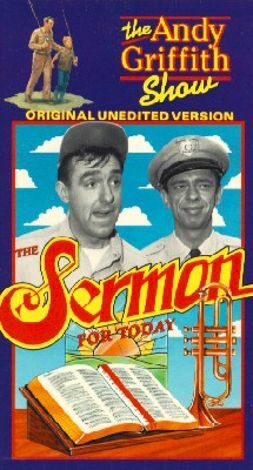 Written by John Whedon, "Sermon for Today" originally aired on October 21, 1963; though filmed as the 100th episode of The Andy Griffith Show, it was the 99th to be shown.